Two bamboo brushes. The brush on the left side has not been altered and the brush on the right side has been trimmed with scissor so that it can create finer lines. If you like to make brushwork on your work, you know that brushes for pottery can be expensive. The cheapie brushes for pottery that are found at pottery suppliers and art supply stores, don’t make the beautiful fluid lines that most potters are after. But David Swenson came up with a solution. In today’s post, an excerpt from the May 2018 issue of Ceramics Monthly, David shares how he gives cheap brushes for pottery a good haircut to get the fluid brushstrokes he wants! –Jennifer Poellot Harnetty, editor. Bigger brushes can be trimmed so that they can hold a lot of material and produce long, fluid strokes. When I first attempted adding decoration onto my ceramic forms, the task was daunting. I was interested in translating some of my drawings and patterning to my clay, hopefully with reasonable similarity. I had drawn with pens that had reservoir tips to allow for longer, more fluid strokes but the brushes I had at the time seemed clumsy. As with many clay questions, the answer resided in traditional practice. 2–5 David Swensen using an altered bamboo brush to create line work on one of his ceramic forms. I had seen some examples of brush bristle stacking and traditional brushes with longer and stiffer interior fibers than the exterior hairs on video documentation of cobalt painting in China. After checking the local stores for similar brushes and not really finding what I was after, I turned to fairly inexpensive bamboo brushes purchased from my ceramic supply store. 6 David Swensen’s cup. The black lines on the cup were painted on using a brush that he cut and altered. I had been happy with the brushes’ ability to flood, or to fill larger areas, but their finer articulations were clumsy. Off to the barbershop to make some alterations! I took a brush, wet the bristles and used scissors to reproduce the haircut I had seen on the finer brushes. At first this felt impulsive, but I was in a hurry to try it out and the results left me very happy. I was not only able to lead longer and more delicate lines, but also still apply pressure for steady transitioning to a fatter line quality. Now, equipped with the right tool, it was a matter of balancing the consistency of the stains with technique, and practice, practice, practice! If you are looking for a book packed with everyday tips for the ceramic artist, look no further than 100 Tips, Tools, & Techniques for the Ceramics Studio. You'll discover how to easily reclaim clay, build custom ceramics tools, glaze using unconventional techniques, and so much more! These 100 tips and tricks will help you improve both your efficiency AND proficiency in the clay studio! 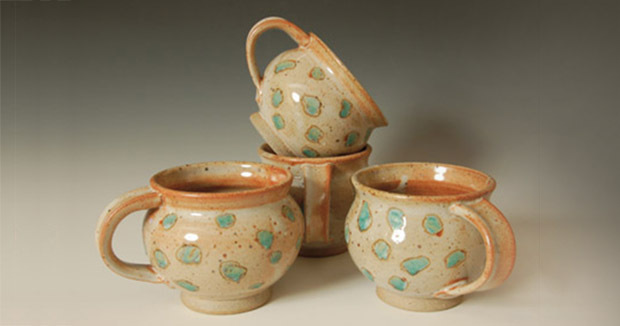 the author David Swenson received his BFA from Alfred University before relocating to the Twin Cities in Minnesota in 2009 when he received a Fogelberg Studio Fellowship at Northern Clay Center. Follow @swenwares on Instagram to see more of his work. Great idea ! I hesitated at the price of a pen with reservoir. That is helpful. Are there more pictures available of the brush tips besides the one shown? I appreciate the advice!